During the month of September, We Hear You will be featuring a special three-part series exploring the ongoing planning cycle and documentation – ‘Unpacking the planning cycle’. In the final instalment of our series, we close the loop on the planning cycle by returning to documentation and records, as well as the practice of evaluating children’s learning and wellbeing using the learning frameworks and educator guides. In part two of our series, we looked at Gathering meaningful information, questioning and interpreting the learning. We considered some questions to reflect on about the effectiveness of methods used to capture children’s strengths, interests and relationships over time and to consider whether Element 1.2.1 (Each child’s learning and development is assessed as part of an ongoing cycle of planning, documenting and evaluation) was visible in this process. This article closes the loop of the planning cycle by returning to children’s records and evaluating children’s learning and wellbeing as well as reflecting on the effectiveness of pedagogy. reflect on pedagogy that will suit this context and these children (Early Years Learning Framework, p.17/ Framework for School Age Care, p.16). 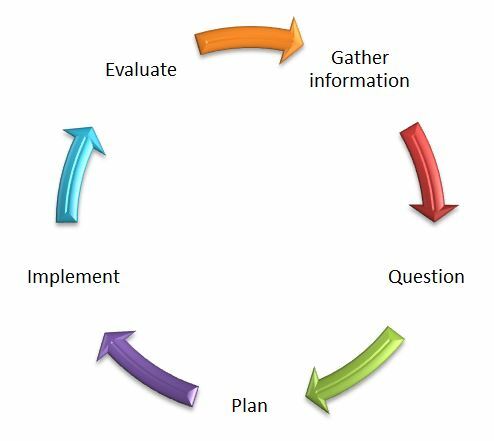 The Educator guides to the approved learning frameworks support educators to engage in the planning cycle, with a particular focus on completing the cycle by assessing and evaluating learning and wellbeing. This is a key component of the process and involves educator decision making about the educational program and practice. It involves setting goals and planning experiences, interactions and environments that build on children’s interests, abilities and identities in relation to the learning outcomes. At this stage, it is helpful to revisit the series of vignettes from article two in this series, which presented examples across a range of different ages. Here, each example showcases a number of methods and techniques to collect information as well as the addition of goals, plans and the evaluation of learning and wellbeing. Where are we in terms of our individual and collective team skills and knowledge about the planning cycle? What does this mean for individual and collective professional development plans? We hope you have found this blog series informative, thought provoking and a catalyst for quality improvement. If you would like to further investigate Quality Area 1, the webcast of the ACECQA National Workshop Educational program and practice is a great place to start. It provides information and resources, as well as prompts for educators to reflect on their professional development needs. In this second instalment, we extend our discussion about documentation to consider the information you are collecting and the way it is used to understand and add value to learning outcomes for children. In our last instalment, we looked at Why do we document? Thinking through the what and the how of the cycle of planning for children’s learning, wellbeing and development. We left you with some questions to reflect on how you document, plan and critically reflect on children’s learning/wellbeing in relation to Element 1.2.1: Each child’s learning and development is assessed as part of an ongoing cycle of planning, documenting and evaluation. Educators use a variety of strategies to collect, document, organise, synthesise and interpret the information that they gather to assess children’s learning. They search for appropriate ways to collect rich and meaningful information that depicts children’s learning in context, describes their progress and identifies their strengths, skills and understandings (p. 38). ACECQA’s Using the early years planning cycle takes educators through the process of critical reflection, providing practice examples as well as linking the planning cycle back to service philosophy. In part two we ask you to consider the information you are collecting, how meaningful it is and the way it is analysed and used to interpret each child’s learning. It is important to remember the reason you are collecting information – it needs to add value to outcomes for children. The following series of vignettes present examples across a range of different ages. Below each case study are questions to encourage educators to focus on the meaningful aspects that might inform the planning cycle. They showcase a range of methods and techniques of collecting information as well as questions and ideas to draw out learning. Remember, there is no one way of documenting – these vignettes are presented as just one example of the planning cycle. What does this information tell us about the way children under three learn? How does this learning affect the way we plan opportunities and environments? How can we further support Jade in transferring and adapting learning and support her agency and interactions? What does this information tell us about Bihn‘s sense of belonging, connectedness and wellbeing? How can we build on the knowledge and understandings that Bihn has developed? 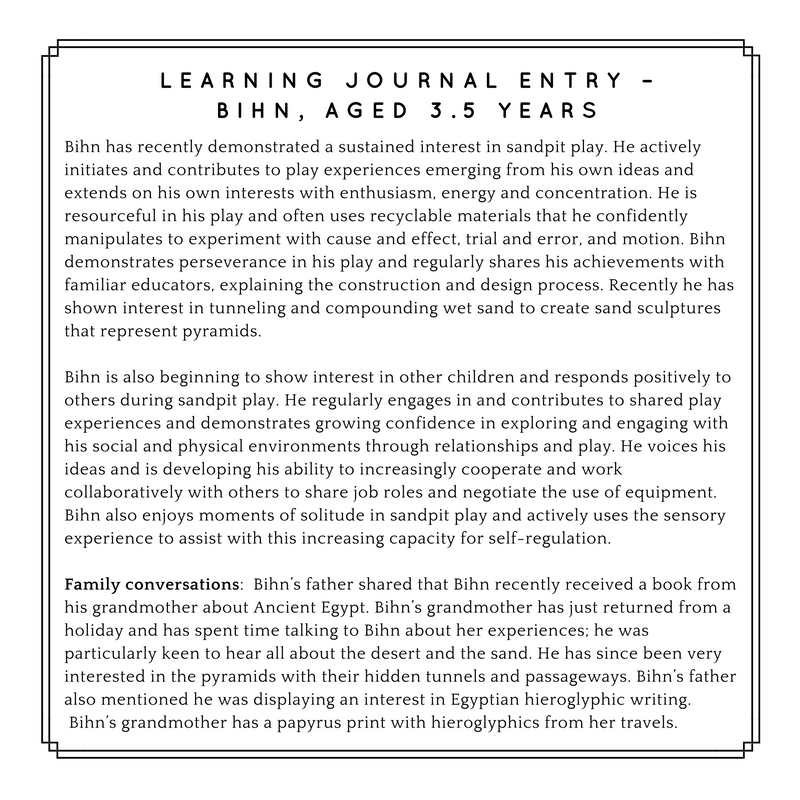 How can we support Bihn’s increasing capacity for self-regulation and provide opportunities for him to engage independently with tasks and play? How can we support these children to find effective ways of communicating their concerns and to collaborate with others? In what ways are we supporting children’s understanding of interdependence and how can we facilitate this sense of ownership and belonging within the program? How do we know what is meaningful information and what is not? How effective are your processes for capturing and recording information about children’s strengths, interests, relationships and learning over a period of time? In the first instalment, we consider the challenges and requirements of Quality Area 1 and Element 1.2.1 and the why, what and how of planning for children’s learning, wellbeing and development. Many educators are finding Element 1.2.1 – Each child’s learning and development is assessed as part of an ongoing cycle of planning, documenting and evaluation – one of the most challenging, according to national assessment and rating data analysis. Is it because educators struggle to articulate practice and why we document? Or could it be that they are not sure about what is required in relation to Quality Area 1: Educational Program and Practice? Or is it a question of not being sure about how to assess children’s learning and development as part of a cycle of planning? We hear from some educators that, at times, they feel documentation is onerous and time consuming. ACECQA is keen to share examples of practice such as those showcased in EYLF in Action: Educators’ stories and models for practice and celebrate the wonderful work that educators are doing to contribute to children’s learning and wellbeing. We recognise there is a wide variety of experience within our readership and we encourage you to engage with the Educators’ Guide to the Early Years Learning Framework and Educators’ Guide to the Framework for School Age Care to take a deeper look at the planning cycle involving questioning philosophy and theory. Over the course of the next few ACECQA blog posts, we will present a series to assist in unpacking and clarifying the requirements of the National Quality Framework (NQF), revisiting and building familiarity with legislative requirements under Quality Area 1. We hope this series will be used by educators to feel empowered and increase their knowledge and understanding of the requirements of the National Quality Standard (NQS) in relation to Element 1.2.1 and the cycle of planning in particular. focused on achievements and children’s strengths, what children know, can do and understand. Often we hear about educators, nominated supervisors and approved providers being caught up in the myth of what documentation and the planning cycle should look like rather than knowing or understanding the requirements. While these are not new concepts, for some, the purpose of documentation may have been lost along the way. critically reflecting on children’s learning and development in a collaborative way with colleagues to affirm and challenge practices. Now let’s move to what is required under Quality Area 1 to inform the planning cycle. The Education and Care Services National Law requires services to deliver a program that is based on an approved learning framework and takes into account the learning needs and interests of each child (Section 168). Assessments or evaluations are also expected to support the delivery of the program for children according to the Education and Care Services National Regulations. assessments of developmental needs, interests, experiences, participation and progress against the outcomes of the program (Regulation 74(1a)). evaluation of the child’s wellbeing, development and learning (Regulation 74(1b)). In either case, the amount of documentation depends on how often and for how long children attend a service (Regulation 74(2a)). The program must be displayed (Regulation 75a) and information about the content, operation and the child’s participation must be provided to parents on request (Regulation 76). The Early Years Learning Framework in Action: Educators’ stories and models for practice provides a wide range of examples and techniques for recording and documenting the planning cycle, including journals, jottings, electronic records and online programs. In thinking about why we plan and document the way we do, you might want to consider the following questions at your next team meeting. How do you currently document and why do you do it the way you do? How have you critically reflected on and evaluated the program?